Since its independence from Malaysia in 1965, Singapore has grown to become one of the most economically successful countries in the world, despite its small size. Its strategic location at the southern tip of Malaysia, and between key trade flows from Europe, the Middle East, and Asia, has contributed to making it one of the largest ports in all of Asia, second only to Shanghai. Whilst the country benefits from its close proximity to larger countries, it can also be subject to influence from their emissions. Today, the country’s trade, transport and petroleum activities only contribute to 0.11% of the world’s carbon emissions, yet local residents occasionally do suffer long stretches of poor air quality due to land and forest fires occurring in nearby Indonesia, a seasonal practice used by farmers to turn wild land into peatland ready for farming. The emissions generated by this traditional farming practice are no small amount. For context, in 2015, concentrations went above 300ug/m3, corresponding to a US AQI of 350 (well above the 301 “Hazardous" threshold). In roughly three weeks time, 2 million hectares of land were burnt and 600m tonnes of greenhouse gas emissions released - roughly Germany’s annual output. 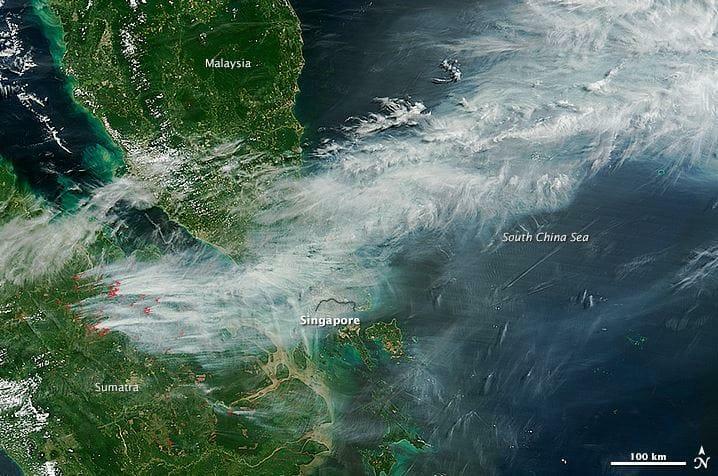 Smoke being blown east from Sumatra island, Indonesia, to Singapore and Malaysia, September 2015. Photo courtesy of NASA. 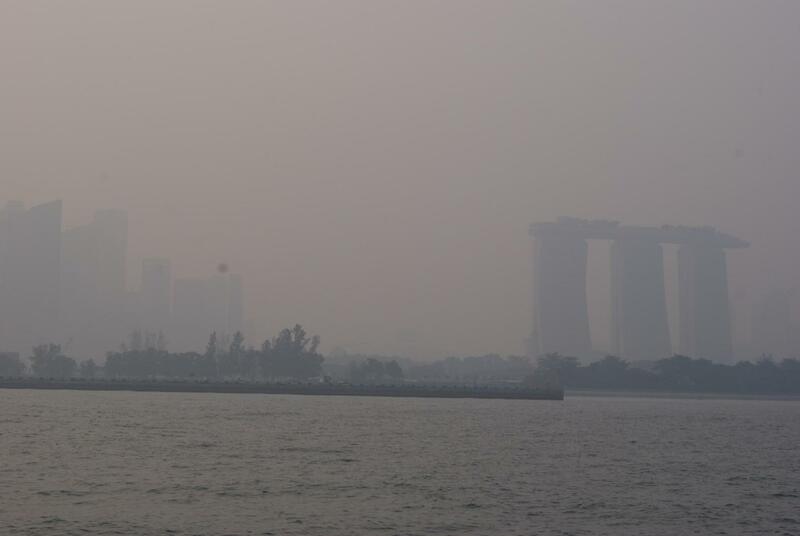 With only dozens kilometers separating Singapore from the closest Indonesian island, the city-state is often covered in haze when peatland fires occur. 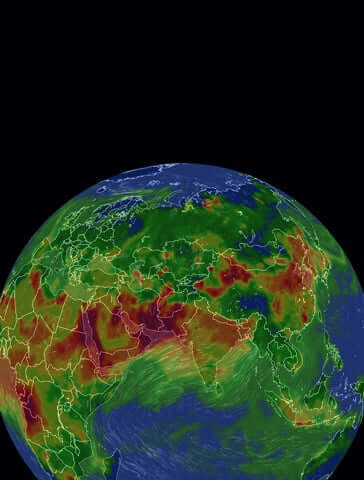 When haze strikes, a number of measures are generally taken by the Singaporean government to reduce citizen exposure. In 2016, schools were closed, events cancelled and trading activities delayed. Meanwhile, political pressure was placed on the companies related to the fires, with legal accountability enforced, as stated in the ASEAN Transboundary Haze Pollution Act 2014. Other companies, such as Asia Pacific Resources International Holdings Ltd, have taken another approach, offering grants to villages in Indonesia who manage to stay fire-free. Of the 6 monitoring stations reported by AirVisual that cover the country’s 720km2, one is a public outdoor Node belonging to engaged mother, Leslie. While the primary motivation for establishing a monitoring station in Minton was for her family, Leslie is now able to provide her broader community access to the same readings she gains so much value from. Giving access to air quality data is the first step towards better protection and a healthier life: she believes that ‘educated, knowledgeable communities are key to make positive change in the world, particularly when it comes to the environment.’ Having discussed with other families concerned about air quality, she decided to install her Node outside her condo, so that the outdoor data collected could be a benefit to many others. “Devices like AirVisual Nodes empower communities to make change, based on hard facts”, Leslie believes. The data, she says, has helped friends and neighbors become more aware and proactive in responding to air quality changes. Today, there is peace of mind in knowing, rather than speculating, her family's personal exposure risk. Check out Leslie's Node here.